Pass around the singing pink piggy! pass him left, pass him right or roll again! Stinky Pig will have the whole family in hysterics! It is time to pass around the singing pink piggy but watch out for this cute little piglet sometimes lets out a parp! noise and you dont want to be left holding the Stinky Pig when he does! Give Stinky Pig's tummy a push to hear him sing and then roll the dice to see which way to pass him. Pass him quickly though! Pass him left, pass him right, roll again but hurry before he randomly toots! If you are left holding Stinky Pig when he parps, you take a token. Keep playing as quickly as you can as it is the player with the fewest tokens that wins in the end! 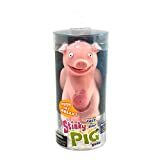 Stinky Pig is great fun for the whole family and is certain to provide hours of entertainment and a lot of laughter. This fantastic game is ideal for 2 or more players aged 6 years and over and includes two "AA" replaceable batteries.